Car manufacturer, Toyota has shot up from number 4 to first place in the top 5 most mentioned auto brands online, making Tata Motors drop to number 2. 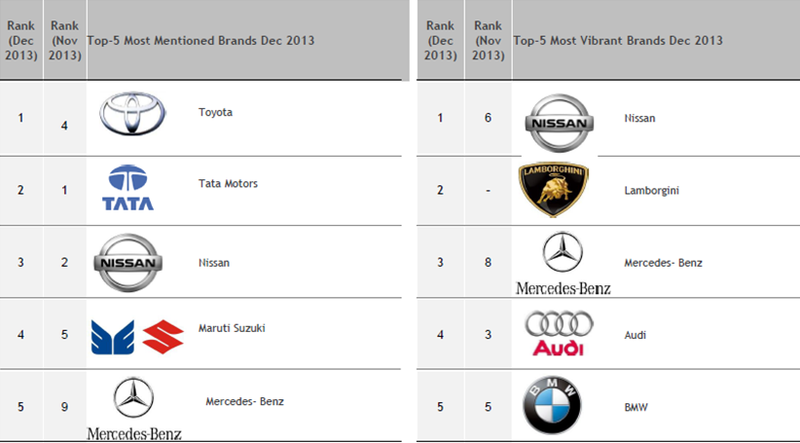 The study by Blogworks India Auto Social Index revealed that Toyota sat at number 4 in November 2013, while India’s largest auto mobile manufacturers, Tata Motors sat at the top. However December’s results report different findings. The recent report tracks the most mentioned and the most vibrant brands, which is the difference between the percentage of positive mentions and the percentage of negative mentions.